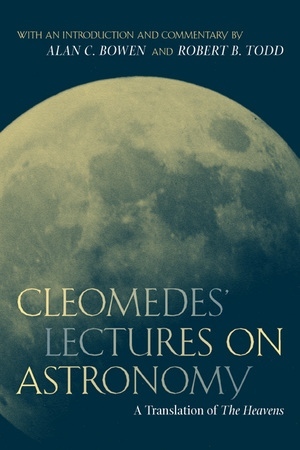 At some time around 200 A.D., the Stoic philosopher and teacher Cleomedes delivered a set of lectures on elementary astronomy as part of a complete introduction to Stoicism for his students. The result was The Heavens (Caelestia), the only work by a professional Stoic teacher to survive intact from the first two centuries A.D., and a rare example of the interaction between science and philosophy in late antiquity. This volume contains a clear and idiomatic English translation—the first ever—of The Heavens, along with an informative introduction, detailed notes, and technical diagrams. 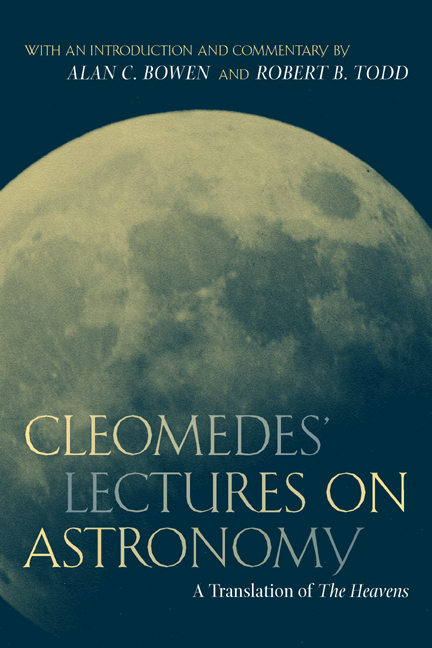 This important work will now be accessible to specialists in both ancient philosophy and science and to readers interested in the history of astronomy and cosmology but with no knowledge of ancient Greek. Alan C. Bowen is Director of the Institute for Research in Classical Philosophy and Science, Princeton, and editor of several books including Science and Philosophy in Classical Greece (1991) and Astronomy and Astrology from the Babylonians to Kepler (2003). Robert B. Todd is Professor of Classics at the University of British Columbia; his publications include Themistius on Aristotle on the Soul (1996) and Cleomedis Caelestia (1990).